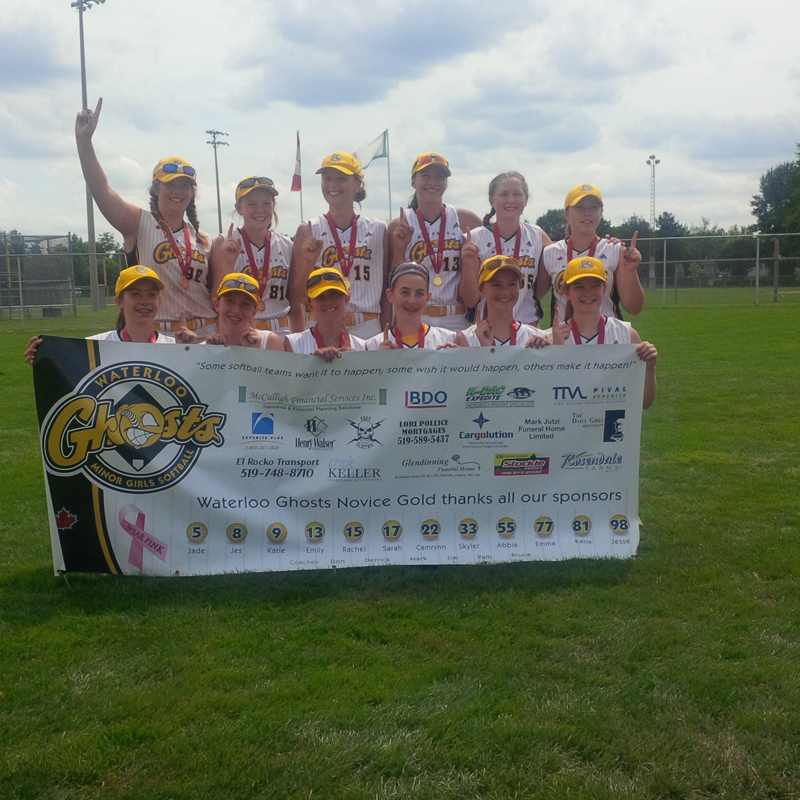 Waterloo Ghosts Midgets are Eastern Canadian champs! 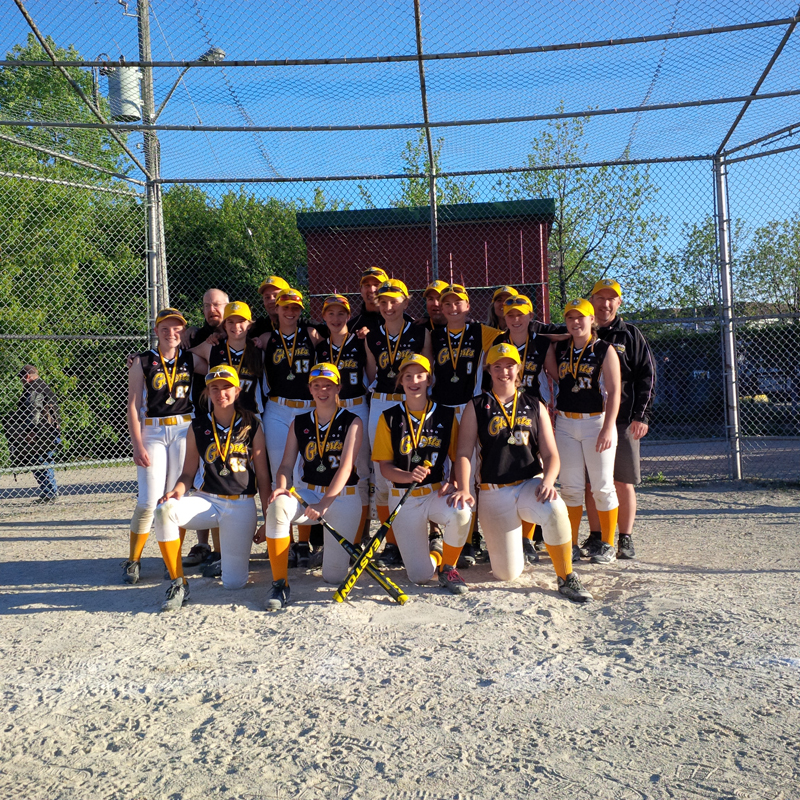 Our Midget team won the Eastern Canadian Championships in Mount Uniacke, Nova Scotia, going undefeated in 7 games to win the Gold medal! 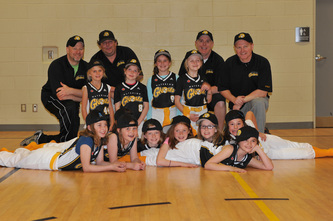 Waterloo Mite Black enjoyed a year of ongoing development and had blast from beginning to end. 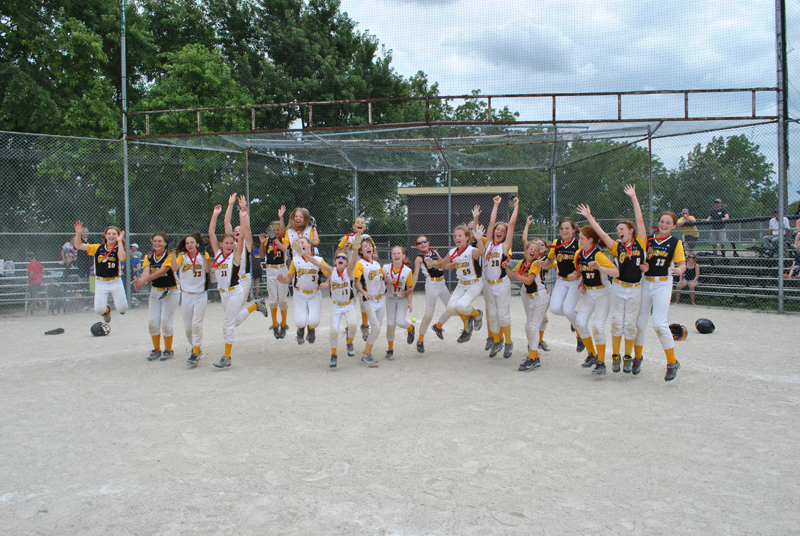 The team had a lot of excitement at provincials winning their first game by a score of 33 to 3 over Windsor. The team went on to represent as best they could before losing out to home town Chatham and being eliminated from the tournament. 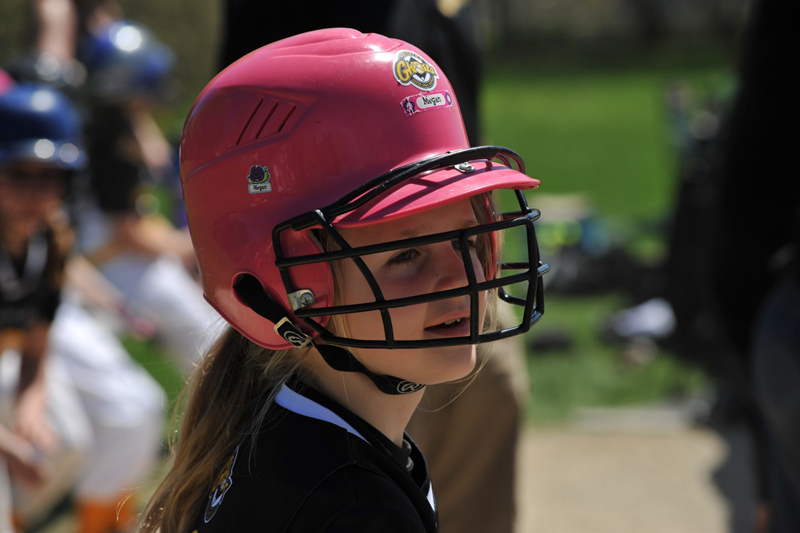 The coaching staff would like to thank the players for their commitment to having fun, not letting anyone else outwork them and always giving 100%. 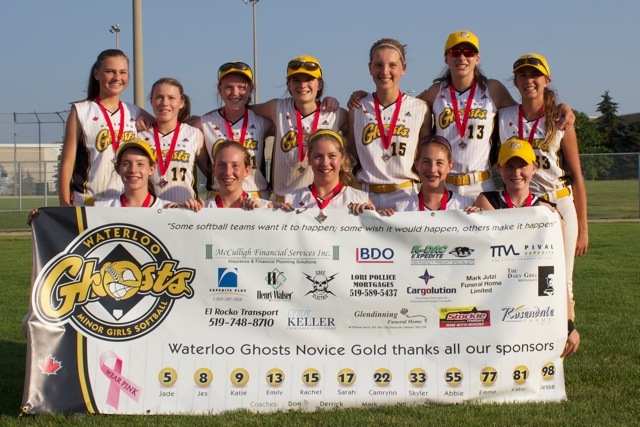 The Waterloo Ghosts Novice Gold team capped a highly successful softball season with a 4th Place finish in the U14 National Jamboree held in Montreal, Quebec during the week of August 14-18. 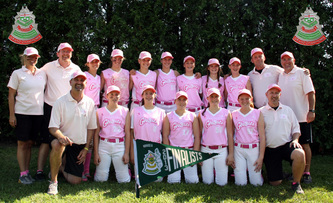 The Ghosts began the “A” Division National Championship round robin with a convincing 6-2 victory over the Victoria Devils. 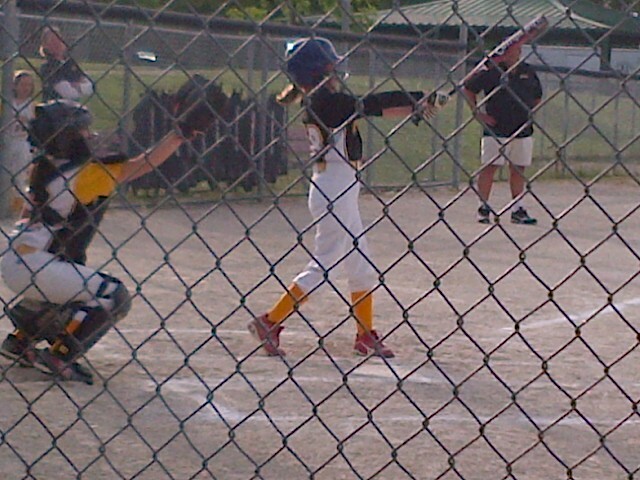 This was followed by a disappointing 6-1 loss to the Guelph Gators. 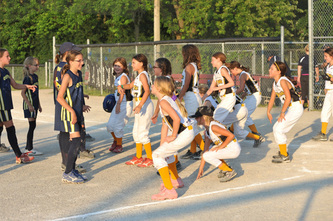 But the girls rebounded with a 6-0 victory over the Winnipeg Lightning, however, they came out flat against the White Rock Renegades and suffered a 7-0 loss. 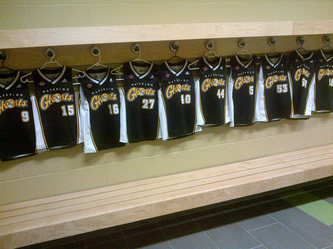 Once again, the team had to re-group and earned a 3-2 victory over the Brampton Blazers. The result was a 3rd place finish in the round robin portion of the tournament. 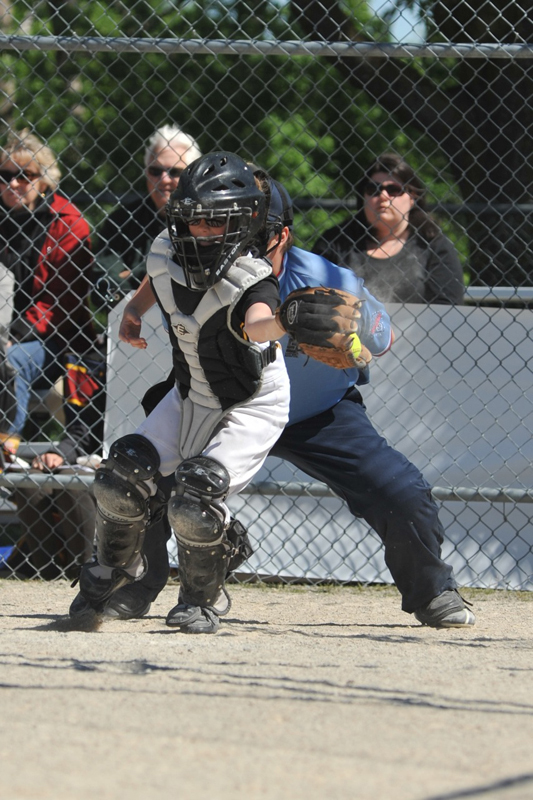 In the playoff round, the Ghosts were faced with a single-elimination status and had to play back-to-back-to-back. 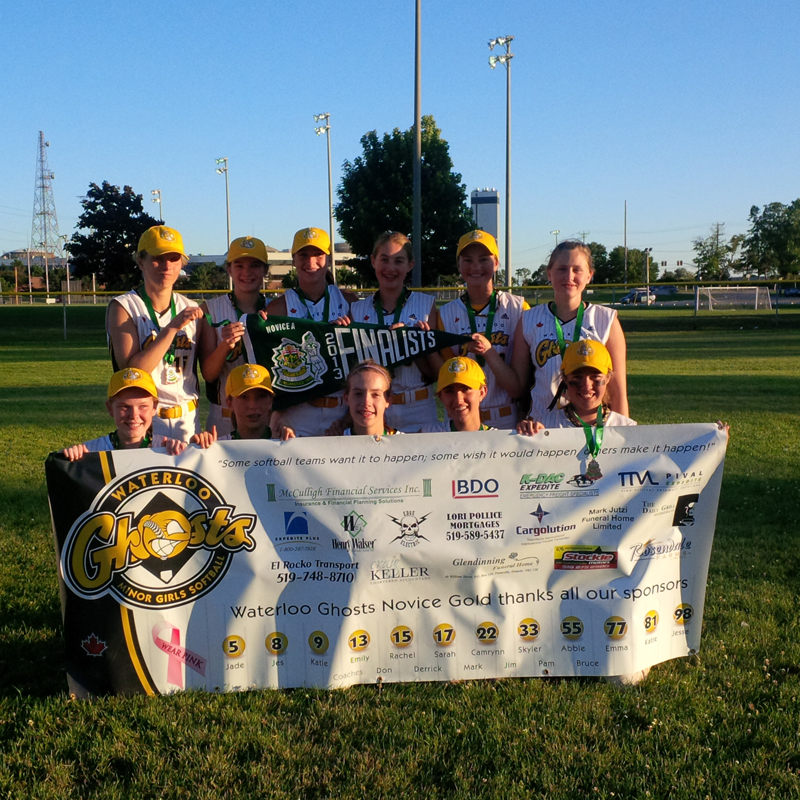 The girls got on a roll with a thrilling 2-1 win over the Mississauga North Tigers, and followed that up with a tremendous effort against the pre-tournament favourites, the White Rock Renegades, and worked hard for another tremendous win, a come-from-behind 4-3 victory. 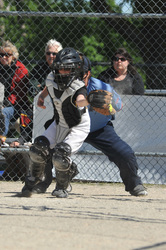 Unfortunately, with a chance for a medal on the line, the Ghosts ran out of steam and lost 2-0 to the Surrey, BC Storm. 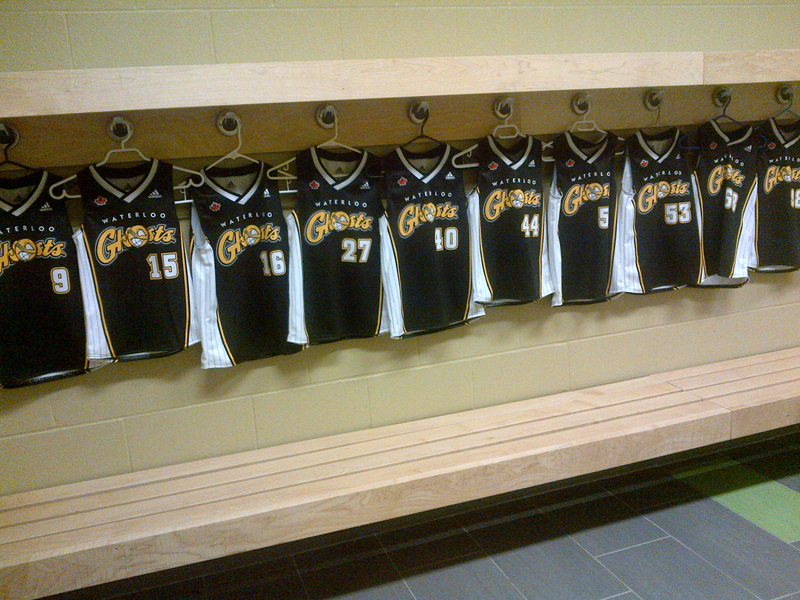 Nonetheless, it was a tremendous result and an incredible experience! 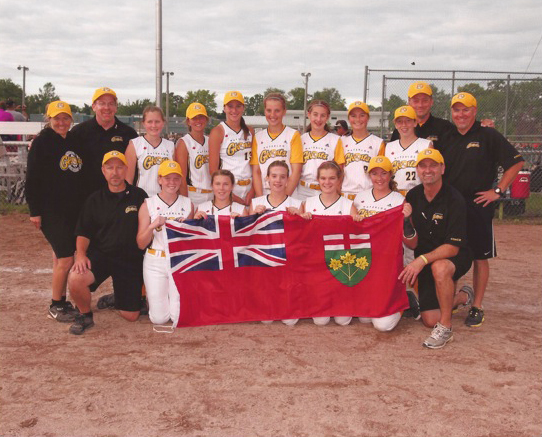 A recap of the season showed success for the Ghosts began back in March with a victory at the Indoor World Series Qualifier Tournament in Toronto. 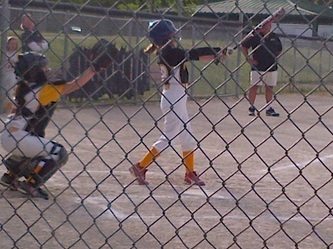 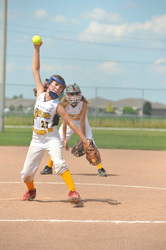 When the outdoor season began, the Ghosts experienced success in the Grand Valley Bantam league play. 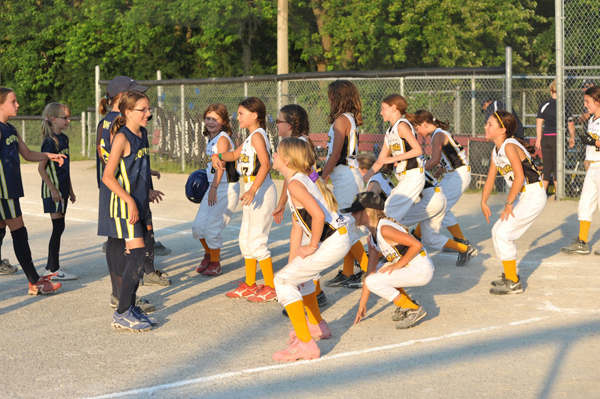 After losing their first two games of the season, the team reeled off ten straight victories, eventually finishing in 3rd place in regular season. 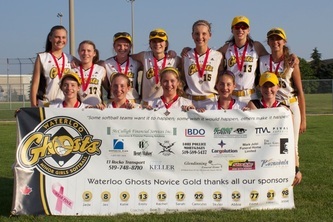 In other tournament play, the Ghosts participated in three Bantam-aged tournaments. 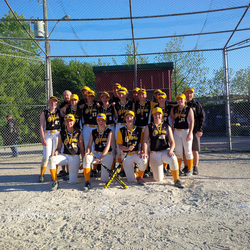 Results at that level included a 5th place finish at the Stratford Lions tournament in May; in June, a 4th place finish at the Toledo Tune-Up tournament (out of 32 teams), and an 8th place finish in the tough Aunt Rosie’s National Qualifier tournament in Amherst, New York, where twenty-two teams took part. 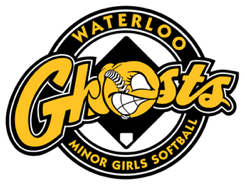 In Novice tournament play, the Ghosts had great success, beginning with a gold medal finish at the Waterloo Ghosts tournament in late May, defeating LaSalle Athletics 9-4 in the championship game. 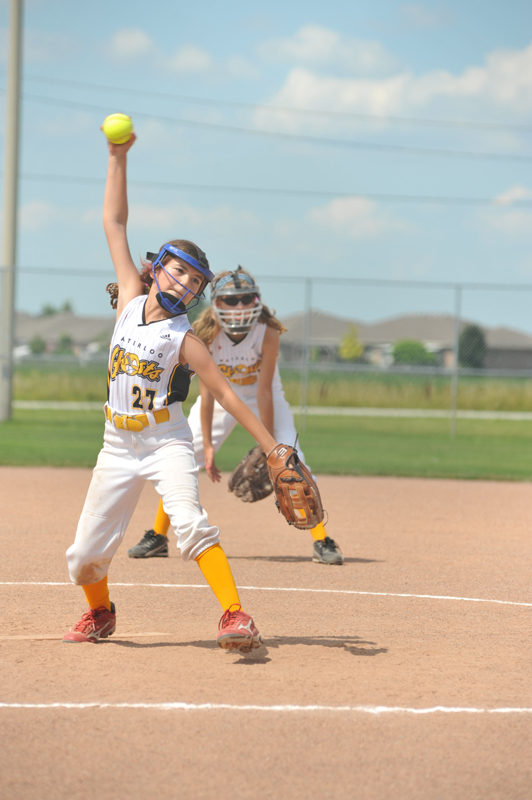 They followed this up with another gold medal at the Mississauga North Partners tournament, a USSSA World Series Qualifier, with a 10-1 final game win over the Barrie Storm. 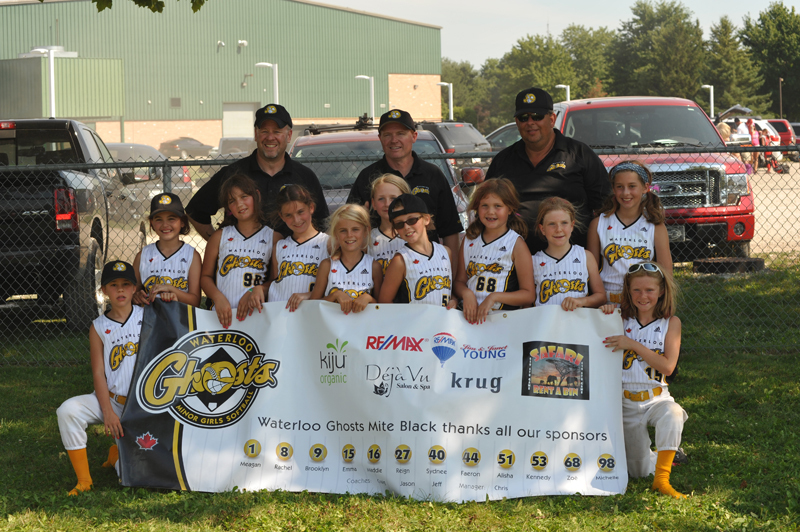 At the PWSA Provincial Qualifier tournament in London, the Ghosts went undefeated, winning 9-2 over the Brampton Blazers in the final. 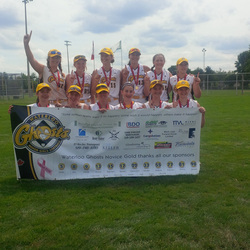 And in the PWSA Provincial “A” Grand Championships in Pickering, the Ghosts came home with an impressive silver medal after a tough and tight 2-1 championship game loss to the Pickering Heat. 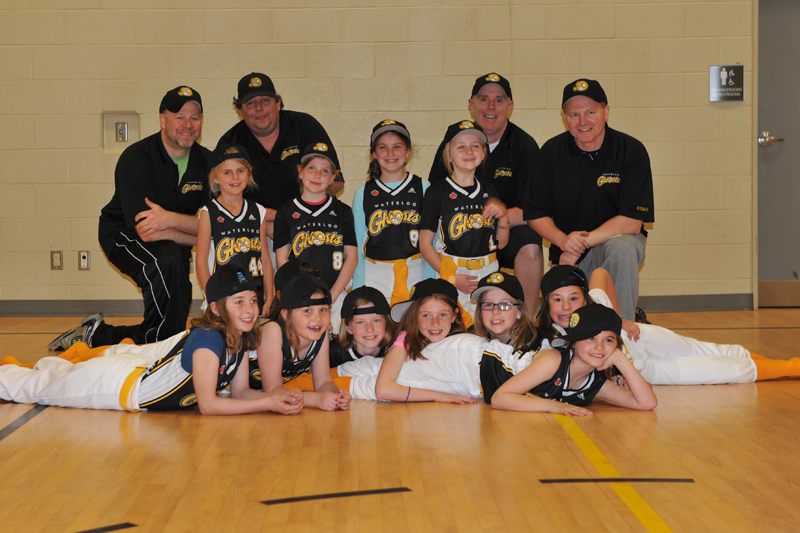 The Novice Gold Ghosts “made it happen” during the 2013 season through hard work, dedication to improvement, and commitment to TEAM. The players, coaches and parents worked hard to function as a complete unit, and represented the WMGSA with pride, passion and perseverance. 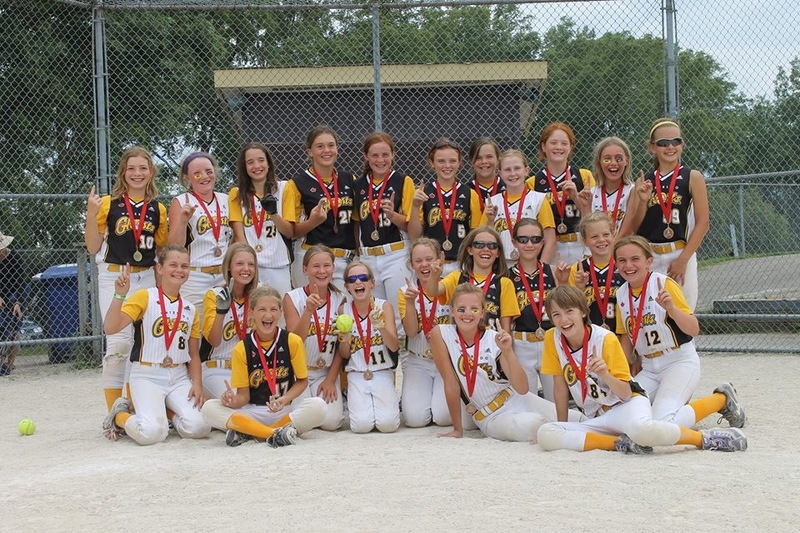 This special group of girls played hard for over 80 games, winning with dignity and class, and managing losses with composure and sportsmanship. 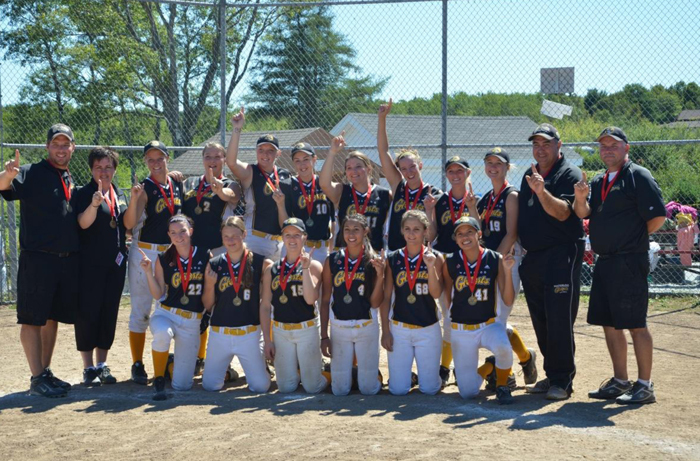 Each and every individual associated with the team should be very proud of what they did to make it a “season to remember”!